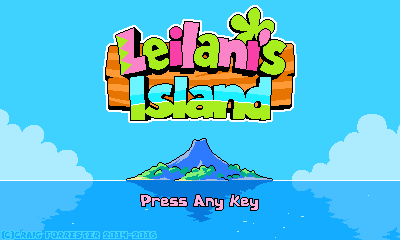 Aloha everyone, and welcome to Leilani's Island! Leilani has gotta roll, run, jump, kick, and smash things to protect her island! Probably a good way to describe it is a cross between Mario, Wario Land, and Donkey Kong. I started work on it around a year ago on a whim because I was reading a lot of game design articles and couldn't resist the idea of a small platform game. It's really expanded a lot beyond that though! I'd like to start showing it to and discussing it with more people as I continue. The aim of the devlog is to show new exciting things that go in, but also discuss some of my design processes and that kind of thing. I'm developing it in C++ on PC, using SDL 2.0 and OpenGL 2.1. I mentioned this on twitter but this looks so good. It's just so polished. I'm curious what influences you're taking from those latter two. Also do you mean the Donkey Kong puzzle game for GameBoy, or the Donkey Kong Country games? Balrog, surt and jaharley94 - thank you! Wario Land 1 is a big inspiration and one of my favourite ever games. The main things I'm drawing from it are the slightly slower pace, and more complex enemy interactions compared to Mario (e.g. even the simplest enemy involves a lot more than just jumping on it - I'll go into my enemy interactions in more depth at some point). I also love how Wario Land 1 is clearly Mario-influenced but has so much of its own personality. I want Leilani to have a lot of personality too and not just feel like a copy of something else. As for Donkey Kong, I meant Donkey Kong Country, and more specifically the recent two Retro Studios games. Leilani's roll move is reminiscent of the DK's. Similar to DK's roll it can be used for attacking but also gives her more agility, so is useful for traversal too. ). It would be nice to achieve something similar. There's so much going on in that first animated screenshot! Already I'm excited for this game I've never played Wario Land but I got a Gimmick feel from the way you've set up the systems to interact with each another. I can imagine playing this game and challenging myself to pull off fancy tricks just because the game allows it. Lovely pixel art and animations too. Good luck with it! Run: Leilani's run is pretty slow and not slippery. It's safe to use but won't provide enough speed for all situations. Jump: Leilani's jump is smooth and has variable height (press longer to jump higher), and she has good mid-air control. 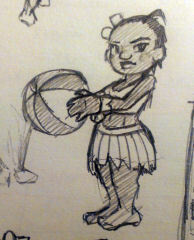 However her maximum jump height is only 3 tiles (with Leilani being around 1.6 tiles tall). As is traditional, jumping into the bottom of a block will bump/break it. Roll: The main focus of the game. Rolling allows Leilani to move faster, bump/break blocks from the side, attack enemies, wall-jump, fit through small gaps, plus some other actions. 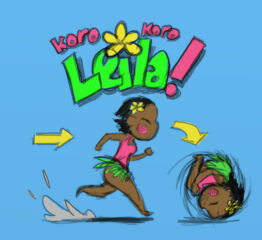 Walk into: Walking into an enemy that isn't stunned will hurt Leilani. Jump on: jumping onto an enemy will stun it. 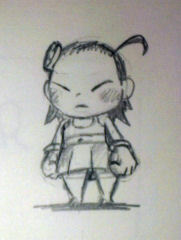 Leilani can do a 4-tile-high jump off an enemy's head. Jump beneath: jumping into an enemy from beneath stun it. Roll into: rolling into an enemy causes the enemy to also roll. A rolling enemy interacts with other gameplay elements the same as if it was Leilani rolling herself. A rolling enemy dies when it hits a wall. Kick: Running into a stunned enemy causes Leilani to kick it diagonally upwards. Spikes: Enemies with spikes will hurt Leilani if they come into contact. For example, a spiky-topped enemy cannot be jumped on, and an enemy with a spike at the front can only be rolled into from the back. Big enemies? : I haven't yet decided how big/heavy enemies will differ. I think that's most of them! Leilani is pretty no-nonsense and doesn't let things get in her way. When she rolls she's a bit of an unstoppable force of nature. Rolling around is fun so I'm giving it as many uses as possible, and limiting her run speed and jump height emphasizes that rolling is the focus. Hopefully the enemy interactions will allow for interesting gameplay and a lot of player choice. These duck guys are the simplest enemies and are called Macas. This comment made me want to finally play Wario Land 1, and I got hooked and beat the whole thing in one day. What a great game. So thanks! Your rolling and kicking move seem to be a really good addition to that game's system of enemy interactions. I also really like that Maca squish in the latest gif. Most of those particle effects are really good and communicative, but the circular gas clouds don't quite fit for me. Maybe because they're used both for the movement of a kicked enemy and when an enemy hurts you, but there's no clear relationship between the two uses. Awesome, glad you enjoyed it! I imagine it's a really interesting game to play for the first time these days, since it's so different from the subsequent Wario Lands with their invincibility and transformations. That's good feedback on the particle effects, thanks. I was a bit lazy and used the smoke for a few things so I'll pick something else to use for the player damage effect (I wanted some lingering effect that shows where the collision happened in addition to the red stars). The purple smoke trails are a bit scrappy too and need neatening up, I think they add too much visual noise at the moment. She doesn't lose any abilities compared to full-size Leilani. Just some height. Since I've been working on her this week I thought I would talk about..
Leilani's design isn't particularly sophisticated, but I think a simple, strong character fits the game well. She doesn't have any nuance to her personality - she's gonna protect her island and that's all she cares about. So her visual design should match that simplicity. The bracelets help to separate her arms and hands, and make them easier to follow during animations. (Now I see why Mario has white gloves.) Bigger feet and shorter size emphasize that she's tough, and keeping the skirt simple (without the fuzzy edge it had in the second sprite) fits better with the game's stylised look. The sticky-up hair is just cute and fun to animate. This looks so charming, great art style and the interaction between the character and enemies/blocks looks incredible. I'm very curious to see more. The gameplay seems to be perfect! ugh this looks so good! But seriously, bring this game to the 3DS or Vita! Thanks guys. Will keep working hard! 3DS would be my dream platform to put the game on - the game is at 3DS resolution (400x240), just in case. For now I just want to make the game as good as I can and will see where it goes in the future. It just keeps looking soooo good! I suggest having a little bit more difference between the tiny and big versions of the character. EDIT- Oh, I just noticed the flower in her hair changes, that's a nice touch. Maybe that's all it needs. Yeah she has a little pink circle (a button or shell or something?) in her hair when small, which gets replaced by the green flower. The flower is more of a noticeable change when you're playing it in a big window rather than watching a tiny gif, plus her small size makes her feel a bit different (though there are no actual control differences). It might also help if the footsteps/rolling sounds are slightly higher pitch for tiny Leilani, so will keep that in mind. 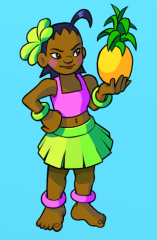 Different hair accessories will also be used for other powerups, but those will also change Leilani's colours. Probably will post more detail on one of those powerups at the weekend. - Love the tropical feel and the really clear bass line. - The Wario Land music, especially the core stage themes, just have so much of Wario's personality in there somehow. Donkey Kong Country Tropical Freeze - You can't argue with the sheer quality of music in this game. Personally I think there was actually a bit too much music and would have preferred if the music had more chance to shine through in the game. It's a good example of the more mysterious / atmospheric style that I'd like to include alongside the more upbeat/energetic themes. If anyone has any other game music (especially from indie games, or from non-Nintendo games generally!) that you think would be good inspiration, I'd love to hear it.